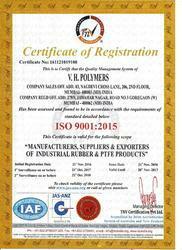 Established in the year 1981, we are one of the professionally managed organizations, engaged in manufacturing and exporting of a wide range of molded rubber components as per the requirements of our esteemed clients. Owing to the wide industry experience we understand the specific requirements of our clients and thus can deliver them the products as per their choice. By doing so, we have won accolades from a large clientele spread all across the globe. Today we have established ourselves as a reputed name in the industry and ensure complete satisfaction to our clients by delivering them the products within a stipulated time of frame. Following a systematic approach towards the execution of the production as well as delivery process, we ensure timely services and complete satisfaction to our clients. Quality is of prime concern to our business and therefore we have established a well-defined system of quality control, where strict vigil is maintained at every stage of product development. We have a team of quality controllers, who check the quality for our products at every stage, right from procurement of raw materials to the delivery of the finished products. Universal Tensile Strength Testing Machine. Hardness Tester. *Bursting Strength Tester. 'O' Ring polymer identifier (Bouncing Tester). All the products manufactured at our end pass through stringent quality check so as to ensure that only the faultless products reach to our clients. We are associated with reliable C&F agents, who ensure in time delivery at the final destination within stipulated frame of time. This has given us due advantage over several other market players in the rubber components industry. Further, we also ensure to provide any kind of transportation to ship our large consignments depending upon the delivery place. MEMBER OF MULTILATERAL RECOGNITON ARRANGEMENT.  Mountings- Pads, anti-vibrators, cushions etc.  Rollers- For paper, photocopiers, textile processing & chemical industries.  Chemical- Plant consultants & manufacturers, individual chemical plants.  Manitenance- Replacement parts for earthmovers, conveyors, compressors, valves, pumps, engines, generators etc.